If you see a button on your Google Chrome that opens a calendar, there is a very huge possibility that EasyCalendar is installed on your computer. This program is available at the Chrome Web Store, so there is a possibility that you have downloaded it yourself. Specialists say that it might have entered your system without your direct permission too. Actually, it does not really matter how it has slithered onto your computer because it is very important that you delete this program from the system. If you keep it, you might become a victim of malware very quickly. Of course, you are the one who can decide what to do with this program; however, we highly recommend that you get rid of it. Many users find it difficult to do because this program cannot be removed via Control Panel. Do not worry; it is still possible to get rid of this program manually. Specialists at pcthreat.com are sure that the presence of EasyCalendar might result in the entrance of all kinds of untrustworthy applications. They have noticed that a message claiming “Plugin update: you have a plugin to update, download and install” is shown on different websites after users install EasyCalendar. This message looks legitimate but we do not recommend clicking on it because you might download a particular file that might download and install all kinds of undesirable programs, including Mindcast, Web Bar, and FastSearch without your consent. The longer you keep EasyCalendar installed, the more malicious programs it will install on your system. Malicious applications might perform different kinds of unwanted activities and you might feel one day that it is impossible to use your PC. You should not wait until this happens - delete EasyCalendar right away. 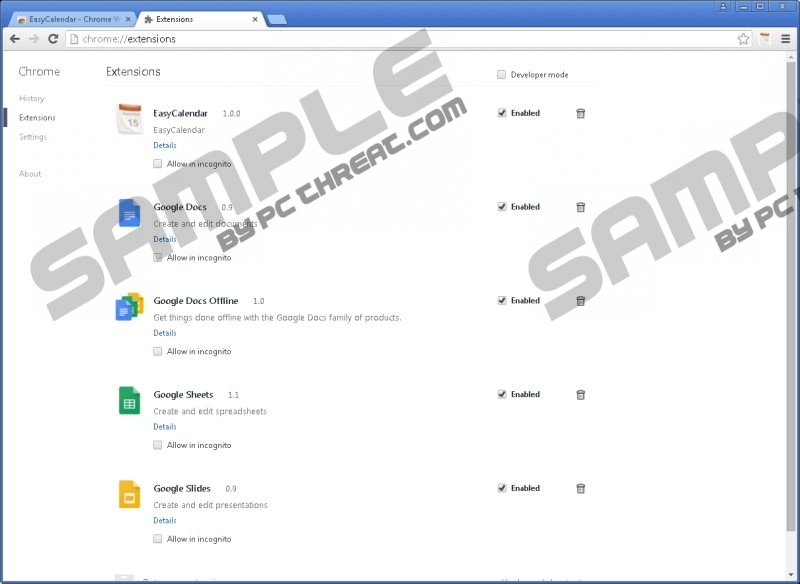 As EasyCalendar is available at the Chrome Web Store, users think that it is a reputable application and download it on their systems. Even though users can get it themselves, this program might enter systems unnoticed too because it is distributed via software bundles as well. According to our researchers, it is very likely that this program travels bundled with other unwanted programs and they might have slithered onto your PC too. You should try to detect them and then erase them all because they might not allow you to use your PC and they might even download malicious programs on your computer. The quicker way to find out more information about your system and the bad programs installed on it is to scan it with a diagnostic tool. EasyCalendar itself will disappear from your system after you remove its extension from Google Chrome or scan your system with an antimalware scanner, such as SpyHunter; however, other undesirable programs (if there are any) will definitely stay on your system if you delete EasyCalendar manually. You can take care of those programs yourself or you can use an automatic scanner. You do not need to do anything else if you have erased EasyCalendar automatically because a reputable malware remover has already erased all other infections from your PC as well. If you use SpyHunter, it will also not allow other potentially unwanted programs and much more serious threats to enter your system in the future. Quick & tested solution for EasyCalendar removal.